What does it mean to make an impact? It means having an influence over something or someone, thereby changing them. This influence can be either good or bad, depending on your actions. Believe it or not, you are making an impact every moment of every day, in one way or another. You are also experiencing the impact of others’ actions on a regular basis. You may have never considered that just one person can make a difference when it seems like it takes a village to do just about anything. The truth is: you can make a difference all on your own, without a team or organized mechanism backing you up. 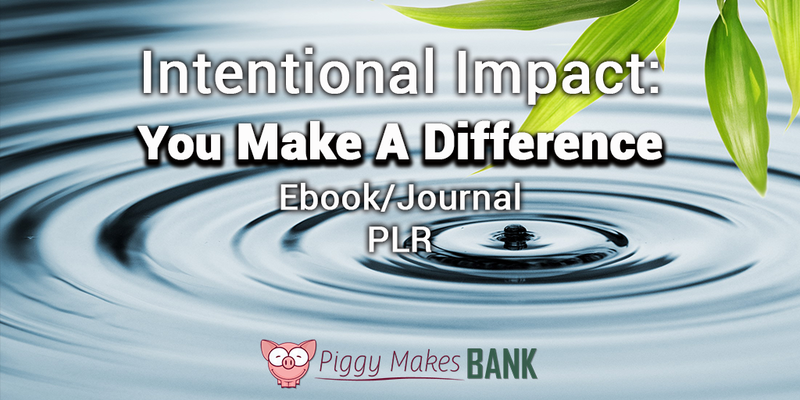 You are actually already making a difference all over the place – you just don’t identify it as being impactful. Show your readers how to identify the special things they are already doing and encourage them to do more of the same, as well as introduce new ideas that they'll be excited to implement with this eBook / Journal combo. This ebook would make a great info product that you can promote to your audience. It would be a perfect addition to The Power of One in Life challenge pack we offer, but works just as well as a standalone product. Edit it slightly as needed to fit your audience and your style, and you can have a brand new eBook up and ready for sale over the course of a day or two. Or take the content and use it to create a class or coaching program on the topic. Of course you can also break the content apart and use it as you see fit. Break it down into three shorter reports to use as lead magnets, or create a long series of blog posts. No matter how you decide to use the content, your readers will appreciate this information on making an intentional impact in the world. You may have heard that it takes 30 days to create a habit and with this journal you can help your readers. There are 30+ pages that will help record thoughts and progress as your audience begins to journal about the impact they want to have in their daily lives. The journal includes prompts and of course plenty of space for them to record their thoughts and feelings. Readers can print out a fresh copy or each month and continue to use the journal for as long as they need it. If you want to help your readers learn how to become more intentional, you can get this incredibly value-packed bundle for only $47. That’s way less than you’d pay a quality ghostwriter to write just a couple of articles for you.